This is a curated exhibit of work by Virginia and West Virginia members of Surface Design Association. This is the ninth year Johnson-Humrickhouse Museum presents an exhibition of contemporary art quilts from participating invited artists from around the world. 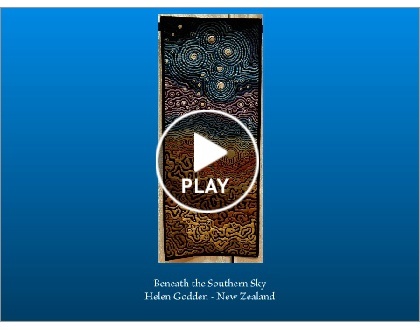 The American Quilter’s Society Lancaster, Pennsylvania, Show had an exhibit, Beneath the Southern Sky. The Lancaster show was the North American debut of this traveling exhibit. Hopefully the exhibit will be at a show near you. This exhibit deals with the balance between economic development, environmental protection and geographical stability in a precarious world. This show features the work of 8 fiber artists in the Maryland and Northern Virginia area. Each artist works in her own style. You are currently viewing the archives for April, 2013 at Woodhaven Studio's Weblog.